Did you know that we offer Same Day Dental Appointments? Imagine that you are at work eating a snack, and all of a sudden you hear something snap! You quickly look in the mirror to examine your mouth and notice that your tooth just broke; now what? The answer is easy, just give us a call and we will work you into the schedule to see what is going on. We are open Monday to Thursday from 9:00AM to 4:30PM, and Friday from 9:00AM to 2:30PM. Your teeth work hard at every meal (and between meals with those of us who snack), it’s time they get a little extra attention. Brushing your teeth twice a day is important for good oral health, but that doesn’t replace a professional cleaning performed by a licensed dental hygienist. The American Dental Association (ADA) recommends having your teeth professionally cleaned twice a year (every 6 months) for those with healthy teeth and gums, and more frequently for those with gum disease. If you have periodontal disease, the ADA recommends that the dentist evaluate the condition of your teeth and gums to determine if you should have your teeth professionally cleaned more often. If you have gum disease, it is common to need to have your teeth cleaned every 3 or 4 months until the health of your gums improves. As your entire mouth becomes healthier, your dentist will then be able to recommend slowly increasing the time between your cleanings until you can get back to the normal 6 month biannual professional cleanings. Candy tastes delicious, and cavities happen! Now what? Fillings are an effective way to replace lost tooth structure. Tooth colored fillings match the color of your natural teeth, allowing the filling to blend in and almost disappear into the tooth. Tooth colored fillings are made of plastic, and have their limitations on when and were they can be used in the mouth. At our office, we can guide you through your best options on how to fix your cavities. Fillings fill in a tooth; crowns fill on the tooth. When you have more “filling” than “tooth”, it’s usually time for a crown. Crowns fit over your tooth and replace the entire outside of the tooth with a strong and durable material. The key difference between a crown and a filling is the way force is directed onto your tooth. A filling will act as a wedge while a crown will transmit the force over the outside of tooth and down the outside of the root, just like a natural tooth does. This proper transfer of force is why a tooth is actually stronger with a crown than with a huge filling. Crowns come in different forms as well ranging from purely functional (gold crowns) to purely cosmetic (ceramic crowns) and everything in between. Our expertly trained dentists will be able to guide you to selecting the best type of crown for you. Give us a call to set up an appointment to evaluate your particular needs and guide you to the best option for you. Dental implants are prosthetic teeth that can be used to replace a missing tooth. These marvels of engineering use the latest technology in titanium bio-compatibility to produce a stable artificial root onto which a new dental crown can be attached. The end result is a new tooth that sits on its own root without affecting adjacent teeth. This allows you to replace a missing tooth without large and cumbersome denture or without affecting the neighboring teeth, as would be the case with a fixed bridge. While dental implants are a wonderful way to replace missing teeth, they are not always the best option. This is why it is best to ask a dentist for their opinion on how to properly replace your missing teeth. What works great for most might not be the best option for you! Amalgam fillings, also called “Silver Fillings” are metal fillings used to repair teeth that have cavities in them. Once the decay is all cleaned out, your tooth will have holes in it. Amalgam fillings will fill these holes and make your tooth whole again! Unlike Tooth Colored Fillings, Silver fillings are made of metals and do not match the color of your teeth. You might be worried about your fillings showing, but at our office, we can best guide you on how to repair your teeth in a way that meets your aesthetic concerns. Remember, the back of your mouth is a dark place and a silver filling acts like a mirror in a dark room (can’t reflect a “lack of” light) so they typically won’t show as much as you might think they would. Being how Silver Fillings are made out of metals, they are much stronger than Tooth Colored Fillings and are able to work in situations where Tooth Colored Fillings can not work. Our expertly trained dentists can help guide you through your options to find the best way to fix your teeth while still meeting your expectations. False Teeth are a great option to replace all or most of your teeth! They are custom fitted to your gums to allow you to chew your food once again. False teeth are able to replace all your missing teeth and give you your smile back. If you have a few teeth left, we can make you a Partial Denture that uses the remaining teeth stability while being supported by your gums. If you don’t have any teeth left, we can make you a Complete Denture which is completely supported by your gums. Our expertly trained dentists can design your false teeth in a way that they will give you the best result possible for your situation. Accidents happen and dentures can break! Fret not, for they can usually be repaired as well. If your denture has a mishap and breaks, bring it in (with as many pieces of it that you can find) and we can usually repair it in a timely manner. For small repairs, we can fix it in the same day. For more serious repairs, we can have it fixed up like new in a few weeks. The most important part of denture repairing is: Don’t try to fix it yourself first! It might seem like an easy fix and SuperGlue might seem like an easy fixer, but it actually makes repairing the denture harder when you bring it in. Dentures need to fit perfectly, and it takes skill and experience to properly repair a denture. If you bring it in broken we can usually get it fixed better than if you bring it in after having “tried to fix it first”. If you had an accident and now your denture broke, give us a call to get it fixed up for you! When your tooth hurts and you just want it out, we can help you. Sometimes, a tooth just needs to come out. This can be for a variety of reasons: not enough space for your tooth to stay, big cavities, or the tooth just broke. Whatever the reason, tooth extractions are quickly and efficiently performed by our well trained staff. If your tooth is hurting and you think it might need to be pulled out, give us a call and we will work you into the schedule to get you out of pain and back into comfort! Wisdom teeth, they aren’t always so wise! Wisdom teeth, so called because they come into your mouth when you are much older than all of your other teeth, and therefore are thought to be more “wise” can run into some problems along the way. If your teeth are big, and your jaw is small, they simply wont fit. In these cases, they should be removed before they finish forming. You might be wondering: why not let them form all the way and pull them if they cause a problem? The reason is simple, if they are going to come in and be fine, our trained staff will tell you so and then monitor their progress as they come into the mouth. If they are not going to come in properly and get stuck (also called impacted), our staff will be able to tell because they have received special training in this particular field. When they see that a problem will arise in the future, they will recommend that you have your wisdom teeth removed before the problem develops all the way. 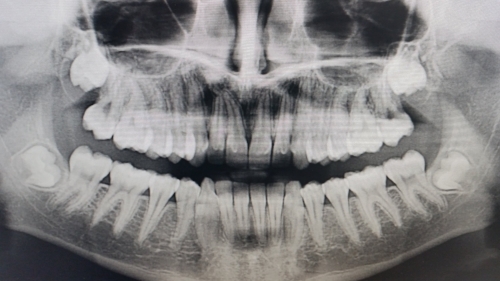 When you remove the wisdom teeth as small “buds”, the roots have not formed yet and the entire tooth is still small since it never finished forming. If you let the tooth form all the way, you will have large roots to extract as well and the healing process will be much more memorable. If your wisdom teeth are starting to bother you, give our office a call to have our trained dentists look.